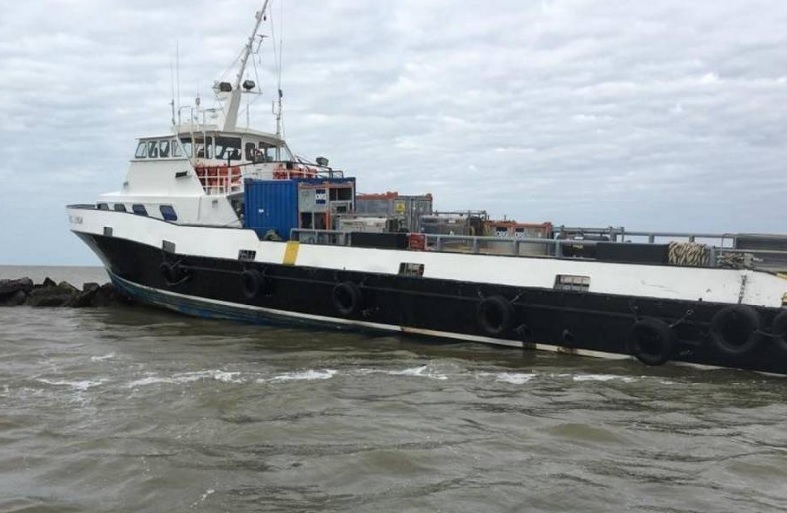 The offshore supply vessel Miss Lynda ran aground at west Cameron Jetties in Louisiana, USA. The ship was en route from Cameron LNG facility to Southport, with 4 passengers and 3 crew members, carrying cargo of construction materials. The vessel stuck into the Cameron Jetty in Lake Charles, suffering damages of the hull, but without reported water ingress. The crew was unable to refloat the troubled OSV Miss Lynda by own means and reported the accident to the local authorities. All the passengers were evacuated from the troubled offshore supply vessel and transferred to utility ship Sally D. The crew remained on board during the salvage, as there was no immediate danger for the seaworthiness and their safety. During the accident the offshore supply vessel Miss Lynda had 4,300 gallons of fuel and 100 gallons of oil products aboard. Fortunately there were no damages fuel tanks and no reported oil leak during the grounding. The local authorities initiated investigation for the root cause of the accident, but according to preliminary information the vessel ran aground after technical failure. There were no reports for injuries and traffic at Calcasieu Ship Channel was not affected. The offshore supply vessel Miss Lynda has overall length of 37.00 m, moulded beam of 8.00 m and maximum draft of 2.80 m. The ship is operating under the flag of USA. Three fishermen disappear in Tabasco, México; they fear they have been attacked by pirates.